Players love being able to use their creativity when building Minecraft worlds; and maybe you have seen a cape or two and wondered how you would design one if you could. Well, now you can with yet another form of personal expression in Minecraft. 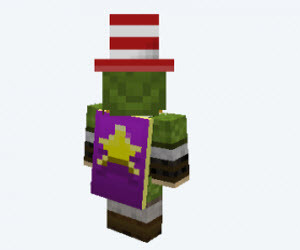 With the Minecraft capes mod, you have seemingly endless possibilities to personalize your avatar with a pre-made cape or one that you design from scratch. You can design every aspect of your cape including background colors, borders, and any graphics you want to display. In less than 30 seconds, you can outfit your avatar with capes that can be animated, transparent, and as unique as you want them to be. Capes, Capes and More CapesThe possibilities are endless with the minecraft capes mod for minecraft. For instance, in the capes gallery, there are all sorts of cape designs to discover. You can choose capes embellished with animals, flags, logos, all kinds of objects, sports, television shows, movies, superheroes, and more. Not seeing what you are looking for? Then, create your own. You can quickly and easily design a cape to reflect who you are, where your passions lay, and the image you want to put out into the world. Just as effortlessly, your one-of-a-kind cape can be uploaded and seen by anyone who has the mod. The capes mod is more than just additional content or aesthetics. It offers you another way to personalize your Minecraft experience over and over again – depending on your mood, the weather, the day, or whatever else sparks your imagination.